Lakeshore Dental is a full dental service facility with professional and friendly staff that provides you with a safe and relaxing environment to meet all your dental needs. Whether you require cosmetic, restorative or preventative services, we can help you. Our professionals offer free consultations, extending expert advice to help you reach the best solution for your dental concerns. Our child-friendly atmosphere and experienced staff is suited for the whole family. Bring your entire family for a routine cleaning and we will schedule all members together. We also offer same-day appointments for dental emergencies because your well-being is our priority. Please contact us if you have any questions or if you would like to schedule an appointment. Are your teeth dull and yellow even with frequent brushing? Teeth discolouration is a common frustration that occurs over time, especially if you regularly consume coffee, tea, red wine and soft drinks. Food and Beverages: Coffee, tea, red wine and soft drinks can stain your teeth. Natural Aging: Over time, your enamel begins to wear and reveals the natural yellow colour of dentin that lies underneath. Tobacco: Smoking or chewing tobacco can stain your teeth. Prior to undergoing any of our teeth whitening services, you must meet with one of our professionals to determine whether this procedure is right for you. At Lakeshore Dental, you can choose our in-office (Zoom) Whitening procedure or use our take-home whitening kit. Take-home kits allow you to produce the same results as the in-office procedure in the comfort of your own home. However, the in-office procedure allows you to experience faster results. Teeth whitening is generally considered a cosmetic procedure, therefore your insurance company may not cover the costs. However, during your appointment, we are happy to assess your candidacy as well as help you understand your insurance policy. Contact us now for more information about Teeth Whitening or to schedule an appointment. Missing teeth is not only unappealing but can lead to several other long-term problems. If left untreated, it may increase the likelihood of tooth decay and gum disease in surrounding areas of the mouth. Dental Bridges or sometimes called a Fixed Dentures can help prevent these issues. It uses false teeth to bridge the gap produced by one or more missing teeth. Prevents unwanted shifting of existing teeth. Evenly distributes bite force to allow proper teeth wear. Prevents damage/decay in surrounding teeth and gums. Prior to the Dental Bridge procedure, you must meet with one of our professionals to determine whether you are a candidate for this procedure. Dental Bridges often require two visits. During the first visit, the teeth on either side of the gap are recontoured for the dental crowns that will be used to secure the bridge. After the recontouring, a model of your teeth is created and used to produce the bridge. You are given a temporary bridge to wear until the permanent one is completed. On your second visit, the temporary bridge is removed and the permanent bridge is fitted. If necessary, adjustments will be made. Contact us now for more information about Dental Bridges or to schedule an appointment. A Dental Crown is a hollow, false tooth that resembles a cap used to cover a damaged or decaying tooth. They are often used after root canal therapy, but are also applied to protect large fillings or broken teeth. Dental Crowns restore a person’s normal ability to chew, but also serve cosmetic purposes. Since they are designed to resemble natural teeth, they are used to cover misshapen or discoloured teeth. Dental Crowns often require two visits. During the first visit, a local anesthetic is applied to numb the necessary areas of the mouth. The tooth is then filed down to allow room for the crown. An impression of the filed tooth is taken and used to create a custom crown. 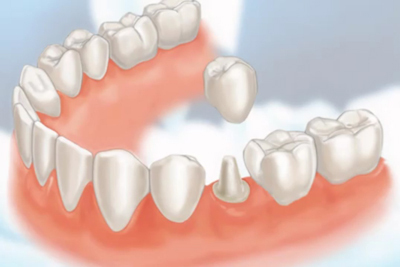 The tooth is covered with a temporary crown until the permanent one is completed. Upon the second visit, the temporary crown is removed and the permanent crown is fitted. It will be tested for a proper fit before it is cemented onto the tooth. Crowns can last over 10 years with proper maintenance. It is important to attend regular appointments and have your crowns checked. Contact us now for more information about Dental Crowns or to schedule an appointment. Dentures are removable false teeth designed to replace missing or damaged teeth. Missing teeth produces complications in your ability to chew, hinders your smile and causes existing teeth to drift or damage your jaw. Dentures will prevent these problems and restore your smile. Creating a set of dentures will take up to several weeks. The process of being fitted with dentures also requires multiple visits. When you visit our office, our Denturist take a series of impressions and measurements of your mouth and teeth to create different denture models. These models are tried and adjusted to perfect the permanent set of dentures. There are two types of dentures: complete and partial. During your consultation, our professionals will determine which type of denture is right for you based on your needs and dental condition. Partial Dentures are used when existing teeth are too weak to sustain a bridge or when multiple teeth are missing from one area. A Partial Denture contains one or more artificial teeth that are attached to a clasp. This clasp is used to grip existing teeth to hold the dentures in place. Every night, these dentures must be removed and cleaned. Complete Dentures are used when all natural teeth are missing. There are two types of complete dentures: conventional and immediate. Conventional dentures are created after the gums are healed from teeth removal. They are fitted approximately 8-12 weeks after the extraction procedure. Immediate dentures are created prior to teeth removal and can be fitted shortly after extraction. However, as the gums shrink during the healing process, more adjustments are required. Both types of complete dentures are held in place by suction and must be removed and thoroughly cleaned every night. Most insurance plans offer coverage for dentures. However, be sure to talk to your insurance company to determine the details of your policy. Patients are often required to co-pay or pay a deductible for their dentures. During your appointment, we are happy to assess your candidacy as well as help you understand your insurance policy. Contact us now for more information about Dentures or to schedule an appointment. Dental Veneers are custom, micro-thin shells of porcelain designed to cover the front surface of your teeth. They are the ultimate cosmetic dental solution that will improve the colour, shape, spacing and overall appearance of your teeth. Veneers are also stain resistant to ensure a lasting beautiful smile. Contact us now for more information about Dental Veneers or to schedule an appointment. Root Canal Therapy is a treatment performed when the nerve inside a tooth becomes infected. The possible causes of an infected or dead nerve include: trauma, tooth decay or a damaged tooth. An infected nerve cannot be treated with antibiotics; instead, the infected tissue must be removed. Root Canal allows dentists to remove the nerve without extracting the tooth. Root Canal Therapy may require up to two visits depending on the condition of your tooth. 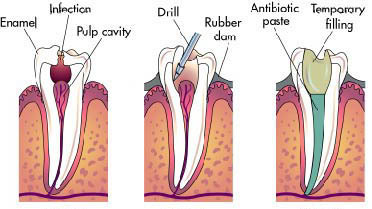 Root Canal treatment is similar to receiving an ordinary filling. During the procedure, all infected tissue is removed from the tooth. The area is cleaned and either filled or covered with a dental crown to restore the tooth’s function and appearance. Contact us now for more information about Root Canal Therapy or to schedule an appointment. At Lakeshore Dental, we only use Digital X-Rays to reduce our patients’ exposure to radiation. X-rays are regularly required for monitoring dental health. How frequently you require an x-ray depends on your medical and dental history as well as your current condition. After an initial examination with our professionals, we can provide you with a suggested frequency of x-rays. Contact us now for more information about Digital X-Rays or to schedule an appointment. Wisdom teeth are the third and final set of molars that usually grow during late adolescence or early adulthood. Most people don’t have room for their wisdom teeth to grow in. Wisdom teeth often grow in misaligned and sideways. They are often impacted (partial tooth eruption) which produces small openings that are susceptible to infection. For all these reasons, most wisdom teeth are removed. 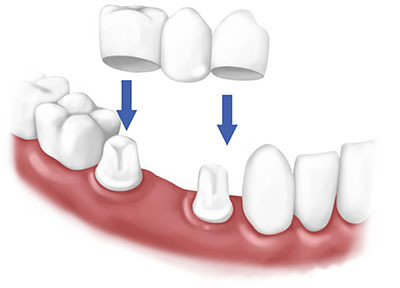 The extent of the procedure depends on the position of the tooth. Meet with one of our professionals to determine what type of procedure you require. In any case, we will safely remove your wisdom teeth while maintaining your healthy smile. Contact us now for more information about Teeth Extraction or to schedule an appointment. Sensitive teeth can make the sweetest ice cream or cup of coffee painful. Acidic foods or mouthwash: Foods like tomato, citrus fruit or fruit juice are high in acidity and increases enamel erosion. Some mouthwashes also contain acids that worsen teeth sensitivity. Teeth whitening: Peroxide-based solutions in teeth whitening products and certain toothpastes can cause sensitive teeth. However, the sensitivity often stops once the product is no longer used for a period of time. Receding gums: Receding gums expose the roots of the teeth. The roots house many nerves making them highly sensitive to extremely high and low temperatures. Damaged or decaying teeth: A damaged or decaying tooth can expose the sensitive nerves within the tooth. Infection may also cause inflammation which leads to increased pain. Sensitive teeth is a common problem many people endure without seeking help. However, with just a short visit to our office, we can eliminate the discomfort from eating your favourite foods. With an application of a fluoride gel or other desensitizing agents to your teeth, your enamel will be strengthened and the sensitivity of your nerves will be reduced. Contact us now for more information about Teeth Desensitization or to schedule an appointment. A filling is required when a tooth is cracked, chipped, worn or decaying. We use a composite filling that is colour-matched with your teeth, making it invisible after the procedure. If you are unhappy with your old, darkened, metallic fillings, talk to us about composite fillings. They are strong, stain-resistant and look identical to your natural teeth. Contact us now for more information about Dental Fillings or to schedule an appointment. Getting your children to brush their teeth is neither fun for you or them. Kids often resent the task and rush through the process, making it ineffective. Some children have deep grooves on the chewing surfaces of their molars which increases the difficulty of cleaning their teeth. At Lakeshore Dental, we use Dental Sealants to protect your children’s teeth. The thin, protective coating is painted on the chewing surfaces of premolars and molars to prevent tooth decay and enamel erosion. A Dental Sealant is a simple and painless solution that will help maintain your children’s dental hygiene. Contact us now for more information about Sealants for Kids or to schedule an appointment. It’s important to regularly visit our office for a Deep Cleaning session. Brushing your teeth can remove food particles and kill bacteria but brushing alone won’t clean stubborn plaque. During a Deep Cleaning appointment, the built-up plaque and tartar is removed from your teeth and the hard-to-reach pockets between your teeth and gums. Preventative dental care is a continual commitment and essential to your dental health. Contact us now for more information about Dental Cleaning or to schedule an appointment. We want to help you gain your best smile with a simple gum reduction procedure using the latest laser technology. During the procedure, your gums will be lifted, contoured and shaped to improve the appearance of your smile. The procedure is safe and gives you the perfect smile with minimal pain. Contact us now for more information about Laser Gum Reduction Surgery or to schedule an appointment. 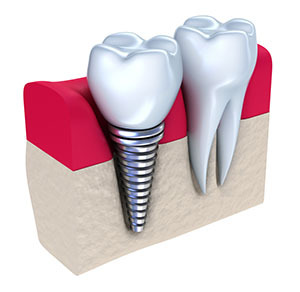 Dental Implants are an increasingly popular solution for missing teeth. The procedure involves embedding an implant securely into the jawbone, ensuring a permanent and realistic fix. If the implant site lacks sufficient bone structure, we also perform bone grafts that provide the implants with the support they require. These procedures are done with care ensuring the best results, your well-being and your comfort. Contact us now for more information about Dental Implants and Bone Grafting or to schedule an appointment. Do you grind your teeth in your sleep? Countless people suffer from this condition and if left untreated, it may lead to headaches, cracking and chipping of the teeth, and harm to the jaw. A simple way to stop teeth grinding is a custom Night Guard. The guard is designed to be comfortably worn at night to prevent harmful grinding so you can rest assured. Contact us now for more information about Night Guards or to schedule an appointment.